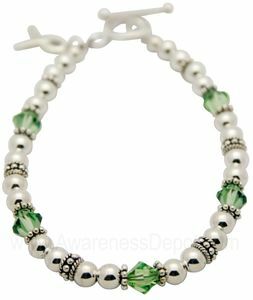 This lymphoma cancer awareness sterling silver and Swarovski crystal bracelet is absolutely stunning. The lime green crystals just reflect light everywhere. This bracelet is made with 6mm Swarovski crystal, and 5mm sterling silver beads. The entire bracelet is sterling silver, even the wire inside. It has a sterling silver toggle clasp and a sterling silver dangling awareness ribbon charm. What an exquisite bracelet!